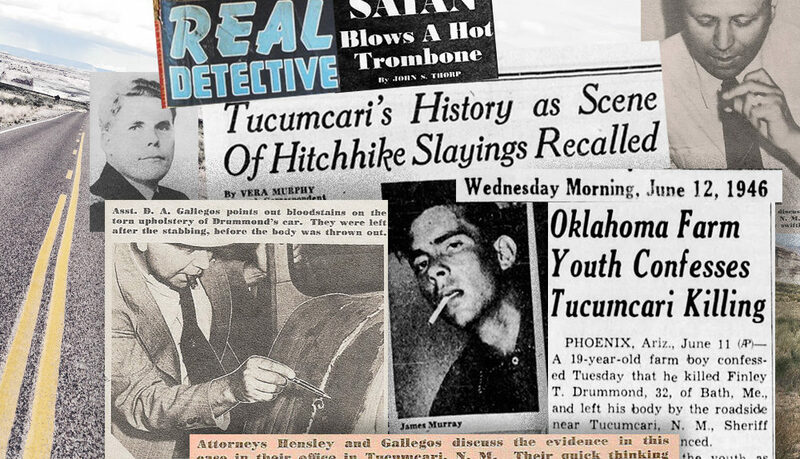 “Satan Blows a Hot Trombone” is what John S. Thorp titled his story about this 1946 Tucumcari hitchhiker homicide in “Real Detective”, a popular true crime pulp. My grandfather also writes how he, along with E.T. Hensley and Sheriff Hubert Beasley, tracked down the murderer. I felt like I had stepped back in time into a 1940’s film noir detective thriller. 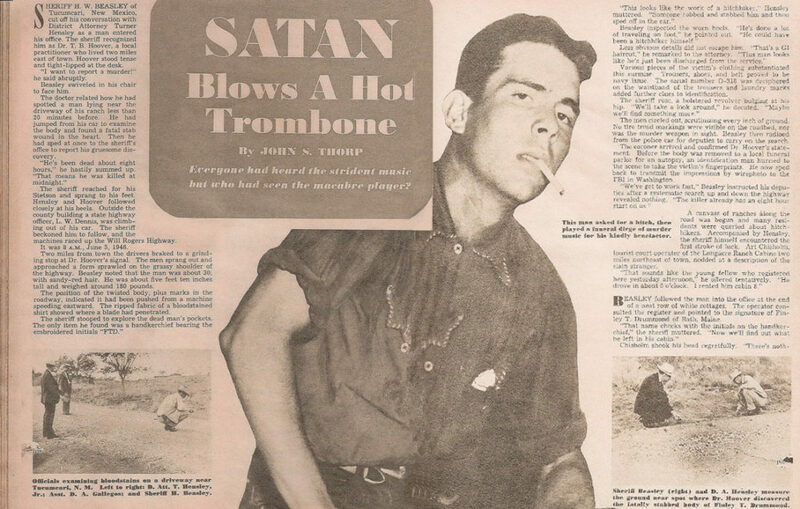 Reading through grandpa’s notes, finding all kinds of news articles, and then stumbling upon an actual “Real Detective” article (image: Satan Blows a Hot Trombone”) with crime scene photos, I knew this was going to be an interesting research adventure. I had no idea the amazing stories my little New Mexico hometown could tell. Weaved in with my grandfather, J.V. Gallegos’ own words, I found numerous news articles reporting on the progress of the murder investigation. The investigation involved the local team working closely with not only each other, but also reaching out across several states to aid in the process. (Image: Three Cities) Early on, there were three brought in for questioning in Barstow, CA. (Image: Suspects). In any story, including this one, I like to try and find more background on those involved. Sometimes it may give some closure to the story or, at other times, it provides new opportunities to ask more questions. One early morning, the Sheriff’s Department, the Justice of the Peace and my office were called and informed us that the body of a man had been found lying on the side of the road that leads to the main highway, U.S. 66., near Dr. and Mrs. Thomas B. Hoover’s residence, located approximately seven or eight miles west of Tucumcari. Upon investigation, we found the body of a tall blond male who had been stabbed in the chest. The coroner’s office determined the death a homicide. There were tracks made by a man’s shoe that we concluded were the victim’s. The soil here was sandy and there were tracks for a distance of about 15 steps before he fell and died. The deceased was a complete stranger to the officers and there was no identification on the body. His trouser pockets were turned inside out in our search for any signs of identification. Sheriff Hubert Beasley announced over the radio for people to view the body at the local funeral home in hope of getting an I. D. for the man. Quite a few people came to the funeral home, but no one could provide an identification. Three days went by and no one had learned who this man was. My frustration was building, as well as the frustration of the other officials. One night I received a call at my home. It was Hubert Beasley, he sounded excited. He told me, “I turned the hip pockets of the victim’s trousers inside and outside again and I found the name, ‘Drummond’ written, apparently by a dry cleaners, right on the back of the pocket!” This vital information gave us a name. Since this man was a stranger, it was determined that the Deputy Sheriff, Bert Jennings, and other city and county officials would check the motels on the east side of the city. Sheriff Beasley and I would check the motels on the west side of town. 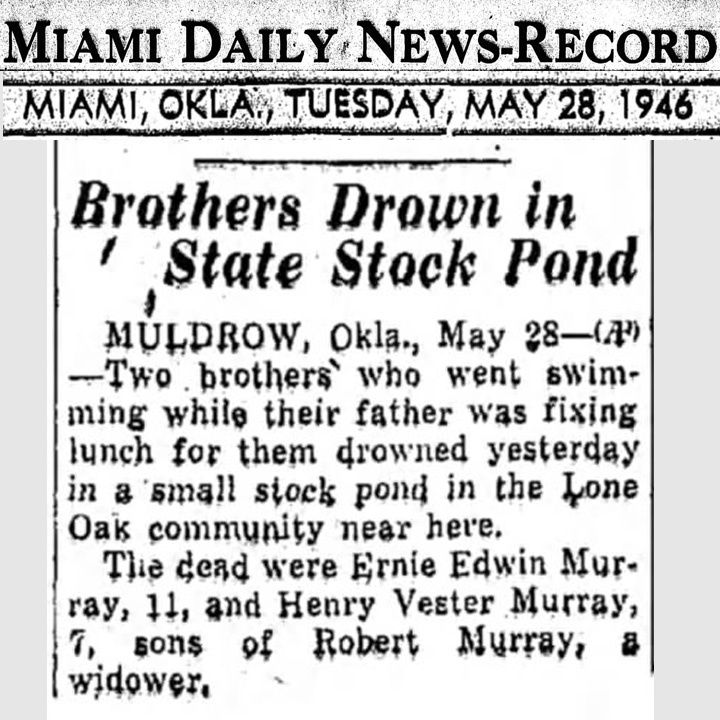 Beasley and I found that a Drummond and a Murray had registered at a motel the evening before the body was found. These two men apparently stayed in the room awhile to rest, paid for the room and left. Drummond had registered at the motel and the address he gave was “Bathme”. Neither Beasley nor I could recall a city so named. On our return to the sheriff’ s office, I said, ”Beasley, there is a Bath, Maine!” We immediately called the officials in Maine and requested information on Drummond. When the Finley Drummond home was called, there was no answer. The officers in Maine later learned that Finley Drummond had a brother, Robert, who had gone to Kansas City, Missouri. Beasley called the officials in Kansas City. They got busy on the case and located the brother of the deceased in Kansas City. Robert Drummond took the first flight available to New Mexico. Sheriff Beasley was very concerned about breaking this case. He had made calls all over the United States for information pertaining to this case. In Cuervo, New Mexico, Mr. Keeter operated a service station. Upon questioning, he informed us that the evening before the body was found, a young man bought gas at this station and apparently was in a hurry because he did not stop the car motor and he didn’t get out of the car. The car was described as a green, old (1938) model Ford. This confirmed the description of the car the victim’s brother had given us in addition to the car license number. Later we thought the man may not have wanted to get out of the car because there may have been blood stains on the car seat. We believed that Drummond had been stabbed in his car and then pushed out or got out and walked those few steps before falling to the ground and dying. Around two weeks went by and Beasley received a call from Phoenix, Arizona. The officials there informed him that the green Ford had been located in the parking lot of a theater. A young man and woman were appre­hended as they were getting into the car. The officers questioned them. The young man told the officers he had purchased the car for $600 but he had no receipt for it. Neither the young man nor the woman could give the officers satisfactory proof of the said purchase. The officers held him for questioning. In a day or two, the same officers informed Beasley that the young man, who we knew now as James A. Murray, kept the green Ford inside a garage. Drummond’s brother, Robert, told us Finley had been a marine and he was on his way to California to be best man at a friend’s wedding. “Finley was well educated, he had attended two different universities, including one in Heidelberg, Germany.” Robert told us. 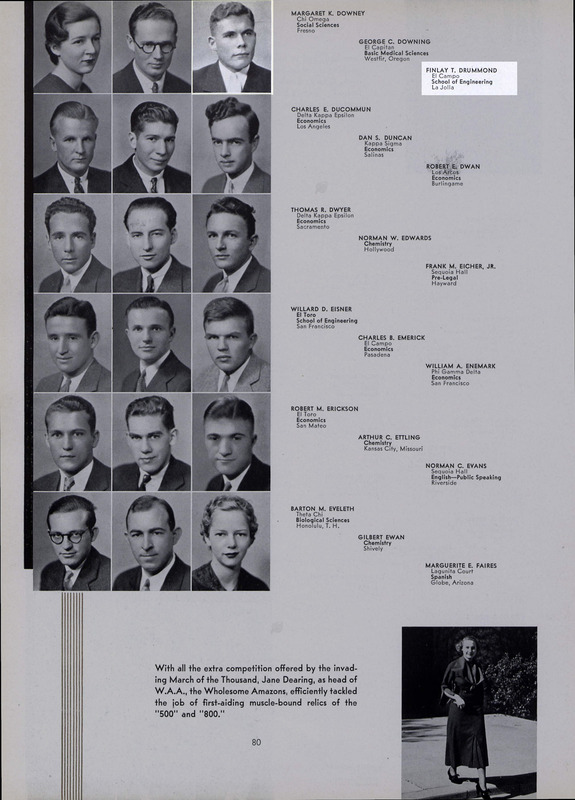 Note: I found Finley True Drummond had attended Stanford University for Civil Engineering (Image: 1935 Standford year book page). He is listed in the yearbook as located in La Jolla, CA, which is where he was headed for a wedding before he was killed. Dr. Hensley was about 90 years old. Getting ready for our return trip back to New Mexico from Arizona, Turner (E.T.) Hensley told me not to let his father drive, as the tires on the old green Ford were almost worn out and there was no spare. So, I drove with Dr. Hensley as my passenger. Come to find out, this car used a lot of oil. At one service station where we purchased oil on our trip back, I had stepped out of the car. When I returned, Dr. Hensley had moved behind the steering wheel. Beasley and E.T. passed us when we stopped for oil and then they lost us. They turned back looking for us. But as it turned out, we made it to Albuquerque sometime before they did. We had agreed to stay at the Hilton in Albuquerque. So we went there, got us a room and went to sleep. The following morning Beasley and E.T. at breakfast. They wanted to know what had happened to us. They said, ”We turned back looking for you, how did you make it to Albuquerque before we did?” We all had a good laugh over this experience. 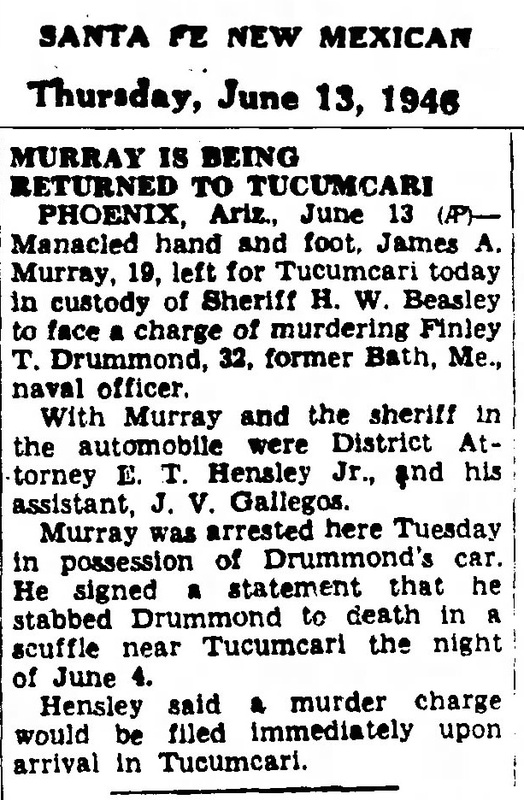 Tempe Youth Gets Life: Gallup Independent reports on October 11, 1946 Murray gets life in prison. Robert Drummond testified at the trial. His testimony was that his brother had never demonstrated any homosexual tendencies. He said his brother was an exceptionally kind man even with strangers. The District Attorney and myself thought we had a first degree murder with the death penalty. Murray had stabbed Drummond without provocation while having the intention of committing a felony, stealing the car. This made it first degree murder. After a little researching, I wanted to find out more about what happened to James A. Murray. I found his New Mexico Penitentiary documents from October 1946. He definitely has a younger, less smug look here than some of those newspaper and magazine shots. 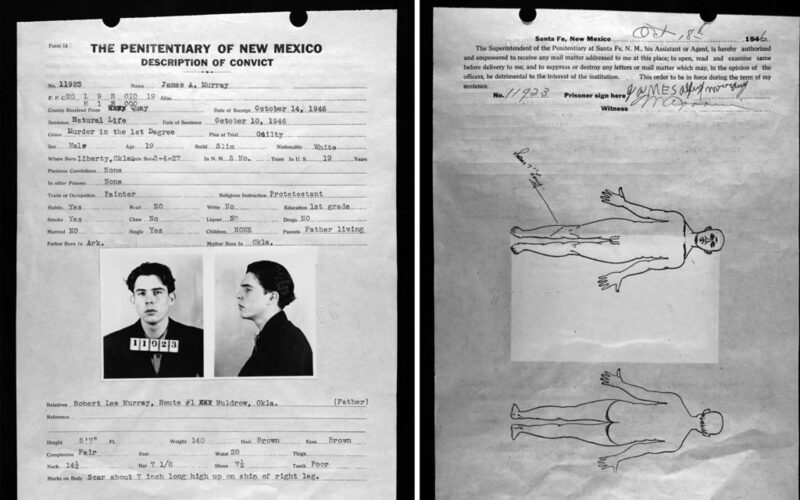 (Image: Penitentiary of New Mexico) In the document, it notes he had a first grade education and could not read or write. Governor Mechem in1951 commuted his sentence from 25 to life to 20 years maximum (Image: Mechem). I didn’t see see any other articles on updates to that, so I assume that James A. Murray was released from prison around 1971. I also found that he passed away in 2002, in Oklahoma, were he was originally from. 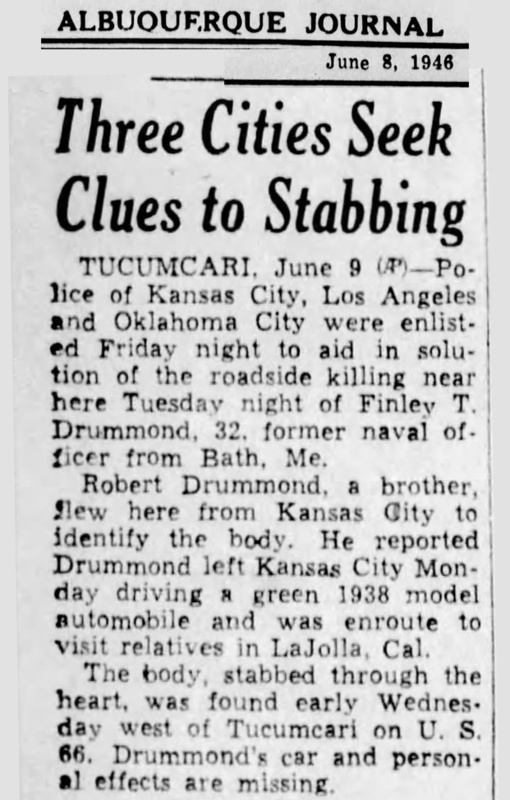 I also found this story mentioned a little later, in 1954 in the Albuquerque Journal, along with some other hitchhiker slayings along Tucumcari’s route. (Image: Tucumcari’s History as Scene of Hitchhiker Slayings Recalled). Very interesting!! I had no idea. I love all the research you add!